Welcome to this week’s edition of “Dinners With Johnny”. I’m excited to announce that, in addition to the weekly “Dinners With Johnny”, there will be a follow-up type of post called “Dinners With Johnny: The Comment Card”. This is where Johnny will post his blatant, sarcastic, wry, dry-witted and humorous review of my cooking. I’m always on the look-out to try something new when I have time to really play in the kitchen. 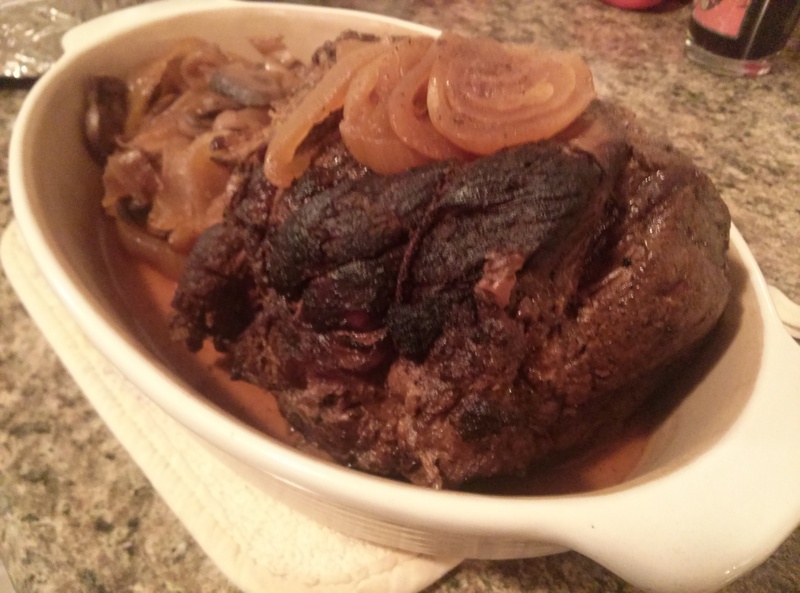 A friend shared this amazing Balsamic and Onion Pot Roast recipe with me and I was sold at everything about it. The one thing that I changed about this recipe: I added mushrooms. I had a partial container of them in the fridge and they just seemed to want to play. ast like a pro (not that I didn’t doubt my abilities one bit). I tripped and spilled mushrooms into my crocpot! Oh no! Next, I threw together some beer bread, because that seemed appropriate. 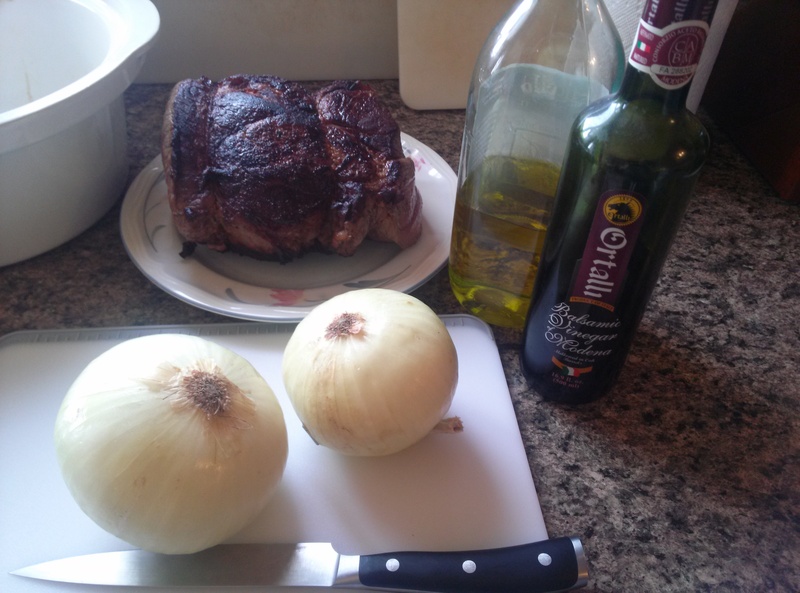 Someone very smart told me that it was important to have something to soak up the pot roast juices. I can’t disagree with that piece of advice. My sister recommended this whole wheat recipe (1/2 wheat/white) and said that my kids love it when they’re at her house. I used Guinness Black Lager instead of something domestic (blech). 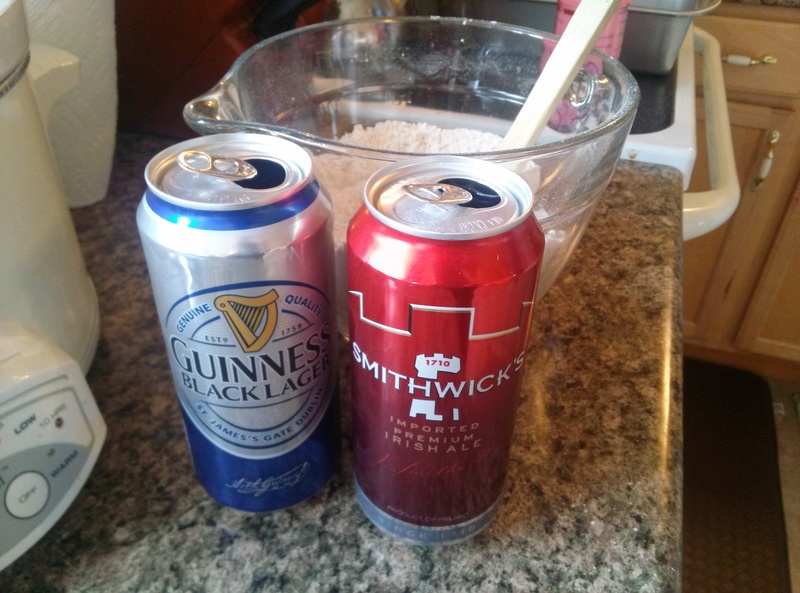 Because the Guinness comes in 14.9 ounce cans and I only needed 12 ounces, I had to do something with the rest–I poured a Smithwicks, sipped some off the top to make room, and poured the remainder of the Guinness on top. 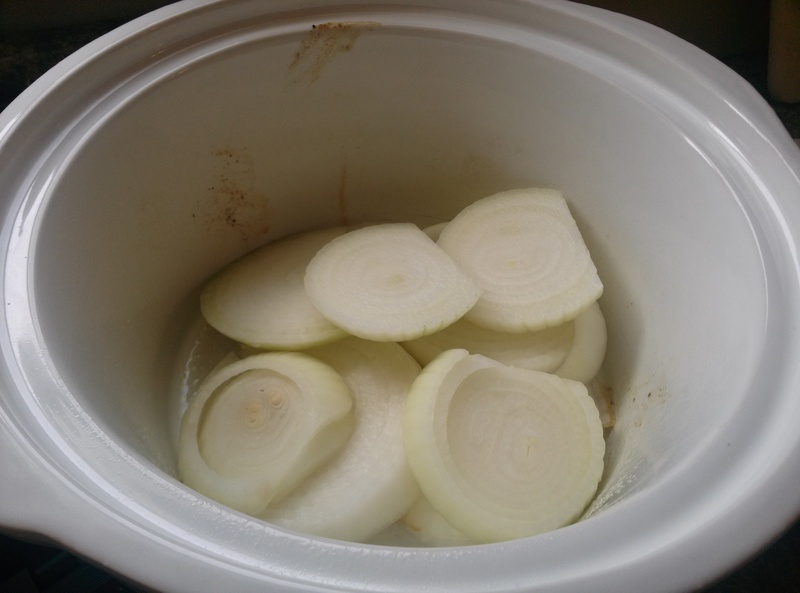 Of course, what is a pot roast without a side of mashed potatoes and steamed carrots? My son would answer: “too many carrots”. I make him eat three of them, just to say that he had some. 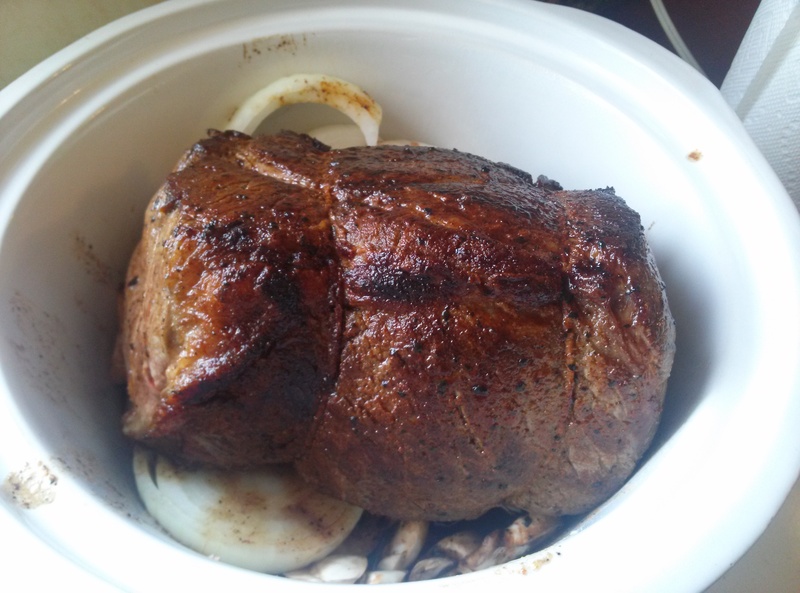 The recipe tells you to reduce down the broth that the roast was cooked in. Don’t skimp on this. Do it like your life depends on it. I had mine at a rolling boil for over twenty minutes before it reduced down enough. It turns into a sweet, balsamic glaze that is nearly orgasmic. Johnny has been informed that he needs to turn in his “Comment Card” soon, so that I may update with his review. 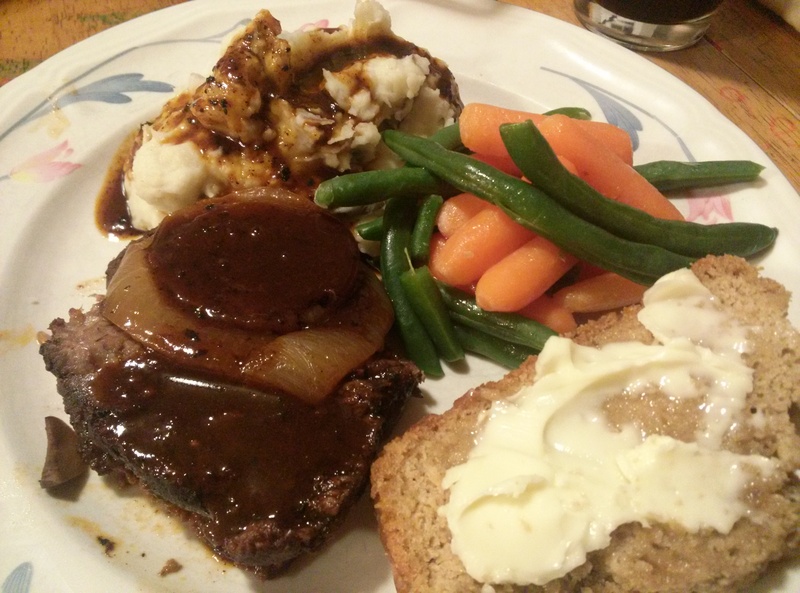 This entry was posted in Dinners with Johnny, food and tagged balsamic, beer bread, dinner, guinness, Johnny, onion, pot roast. Seven years ago, I went back to work and it was in a little, small-town Rib joint. We had the best ribs I’d ever had in my life. Sadly, the place burnt down (leading me to my present place of employment). I have missed those, fall-of-the-bone ribs and have been very picky about ordering ribs in a restaurant. Recently, a friend picked up, and slow roasted, four racks of ribs; they blew the rib joint’s right out of the water. I’d only ever purchased those precooked ribs and they were only ever “so-so”. I decided that I had to try my hand at real ones. 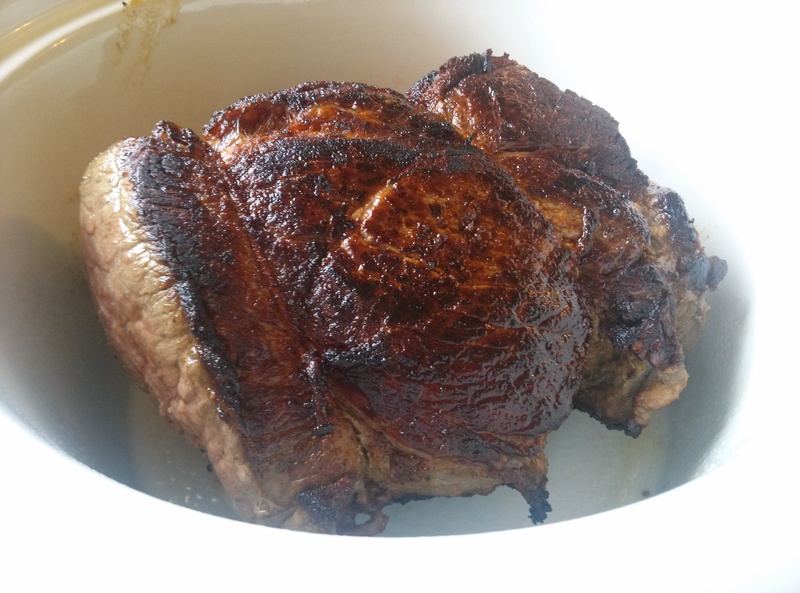 I rubbed down two racks with brown sugar, salt, pepper, paprika and a bit of cayenne. I then put the on a greased, foil lined sheet pan and tented the top. I let them roast for about two hours, then pulled the foil off and basted them with bbq sauce. They glazed over just right. And what goes perfectly with ribs? Homemade Dijon cheddar mac and cheese, of course. Many napkins and contented sighs accompanied this meal. Slather on the bbq sauce! This entry was posted in Dinners with Johnny, food and tagged Johnny, Mac n Cheese, Ribs. I’ve been really lazy in updating my actual food blog and for that I apologize. I’m going to do my best to remedy that. I’ve decided that I’m going to start a new category, called: Dinners with Johnny. Johnny is my brother and lived with me for over seven years. He moved in when my ex and I were still together and stayed with for seven years after my ex and I divorced. We had our moments of struggle and frustrations, just like any siblings (especially adult siblings, living together) but he became a major source of companionship and support to myself and my kids. This fall, I sold my home and we had to part as roommates–him moving just across the lake and myself, down the road. It was important that I not lose the time with him after we moved into separate households. With Tuesdays being my day off, we have fallen into a weekly dinner night so that we can keep that connection strong. This gives us time to visit, watch stupid tv together and for me to feed my culinary passions. I love the planning stage, just as much as I love the preparing. Here we are, so young…so many years ago. 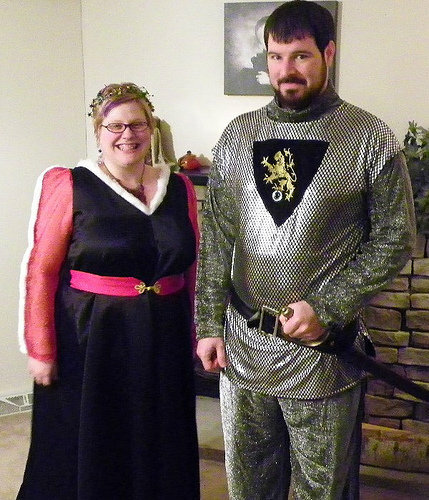 We showed up to Christmas dinner with our family, dressed like this. This entry was posted in Dinners with Johnny, food and tagged dinners, food, Johnny. I maneuvered a couple of extra days off during my kids’ school vacation and have really been enjoying this time spent with them and family from near and far. My parents came up from Rhode Island on Saturday and my youngest brother surprised us by joining them for the trip; he surprised me even further by asking to stay with the kids and I. I’ve been able to read some, knit some, host some, visit some and play in the kitchen. 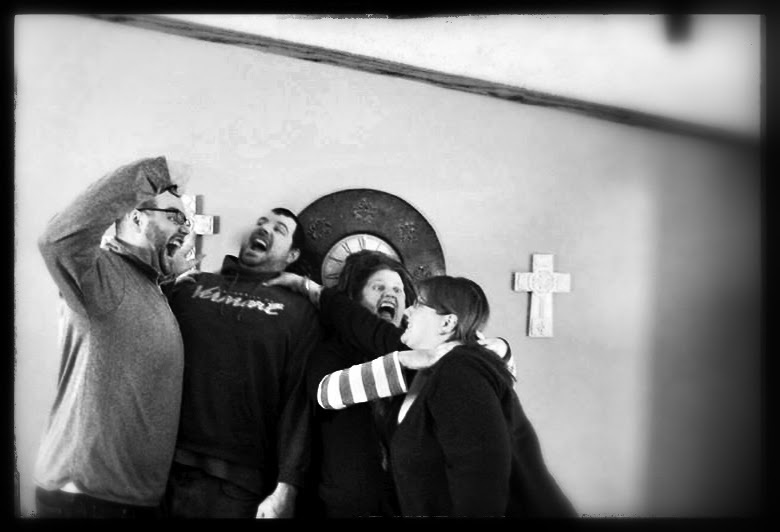 We said goodbye to the Rhode Islanders yesterday, after Christmas Brunch at my sister and brother-in-law’s. This morning, we awoke to snow blanketing us and the obvious thing to do on a snow day is to have a lazy, decadent breakfast, right? I used leftover ham (from brunch) and Yancey’s Fancy X-Sharp Cheese for the omelets, sage sausage from Middlebury Foods meat box and then used leftover chili to make Chili Potatoes. I hope you’re all having a wonderful season celebrating to your heart’s content. I know I sure am. Clementine, star anise, whole cloves, nutmeg, cinnamon and cardamom, OH MY! One of my bosses picked up an Amish cookbook and asked me if I had ever heard of a Sawdust Pie. I’d lived in Pennsylvania–right in the midst of Amish Country–but I’d never heard of this before. I decided to give the recipe a go and it turned out amazing, so much in fact that I made it again this week at work, and my boss ordered a pie for himself. Place chocolate chips in bottom of pie crust. Mix remaining ingredients together and pour into pie shell (mixture will be thick). Serve warmed with some vanilla ice cream or a cloud of homemade whipped cream. 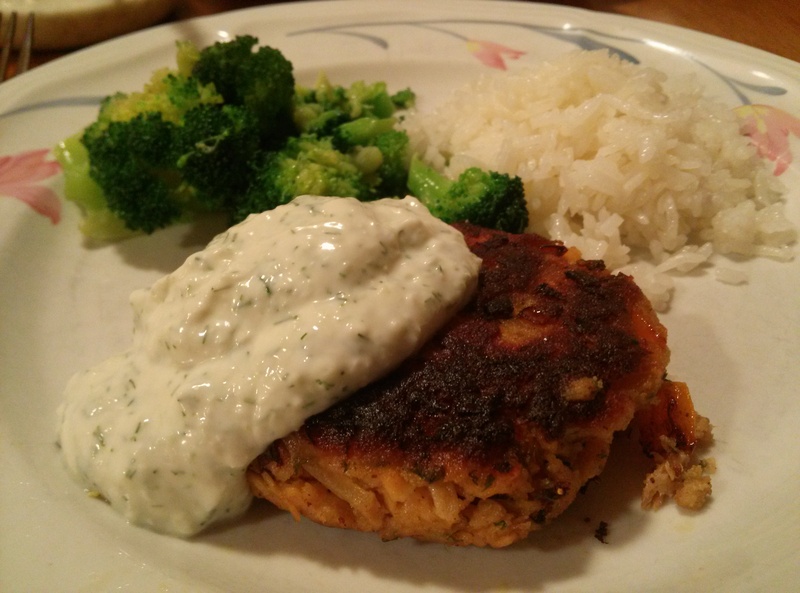 Fresh Salmon Cakes with a cucumber dill sauce. The end of the summer was more than I bargained for. I put my house on the market. My creativity was certainly drained as I had to grab my kids and be out of the house, usually right about dinner time. It was easier to deal with frozen meals then to make a mess out of the house, cook and then clean it all up. We got an offer and accepted it (all within a month of listing it). Everything else just came at me so fast from there on out. Twelve years of life in that home brought with it twelve years of stuff that piled up (and things that we found from the original owners, thirty years ago) and repairs that needed to be tended to. Mold was found in our attic roof, we had to put in a radon mitigation system, fix siding and many other various repairs. Amazing people came to my rescue, emotionally and physically. My kids transformed into amazing, mini-pillars of strength; I never realized how close of a family the three of us would become because of this new adventure in our lives. I packed as much as I could, as soon as I could. I battled depression, lost sleep and lost weight. My entire house was packed into a 28-foot storage trailer, moved that to the new place (which I secured that within a month of having to move) and became temporarily displaced for two nights. Gracious friends opened up their home to the kids and I. And what rotten house guests we were! The Girl-spawn chased our hostess out of the kitchen, telling her to sit down while we made dinner for them. Our hostess managed to get over that, with a glass of wine in hand. We downsized considerably and managed to further purge after moving into the new place. It was difficult saying goodbye to the closest I’d ever been, to my dream kitchen. I finally have my new house settled and feel more at home than I ever have. I get to make this my own place and create new memories. It was now time to have a proper dinner party, all planned out. I invited five of my friends and delegated out which dishes to bring, that would compliment my main course. Baba Ghanoush, marinated feta and a cheese and cracker plate started us all off. Caesar salad and crusty bread accompanied the baked lemon salmon filet, cucumber dill sauce, jasmine rice and steamed broccoli. We finished it everything off with chocolate raspberry cake and a chocolate bourbon pecan pie. The best part? I asked three people to bring wine and we ended up with nine, yes NINE bottles. My friends never leave me hanging. I’m really glad that I planned on having leftover salmon because it made the most delicious salmon cakes for dinner this evening. And without further ado….here’s my recipe for salmon cakes that I couldn’t keep my kids from devouring. Put 2 teaspoons each of butter and olive oil in a large skillet along with the onion, pepper, parsley, Tabasco, Worcestershire sauce, Old Bay seasoning and a half teaspoon each of salt and pepper. Cook over medium-high heat until the vegetables are soft, about 15-20 minutes. Let cool to room temperature. Flake the cooked salmon into a large bowl. Add the cooked vegetables, breadcrumbs, mayonnaise, mustard and eggs. Mix well. Cover and chill in the refrigerator for 30 minutes. Heat the rest of the butter and 2 tablespoons of olive oil in a large saute pan over medium heat. Fry five cakes at a time, 3-4 minutes on each side, until browned. Place on a paper towel to drain and keep them warm in the oven while you finish frying the second batch. Serve hot. I had leftover rice, dill sauce and steamed up a bit more broccoli. When I was a teenager, my family decided to change their diet, dramatically. We cut out all dairy, eggs, meat, refined sugars, white flour and regular salt. Mom started using us as her guinea pigs and she kept us from starvation. I don’t adhere to that strict diet any longer because, let’s face it, fake Bacon is not Bacon. Also: Turkey Bacon is not Bacon, either–just because the label says “Bacon”, it does not make it Bacon. I do still find myself going back to some of her recipes, though, because they’re just so damn tasty. They also bring back some amazing memories. Zesty Pesto Pasta Salad is one of my favorite recipes from my mother’s self-published cookbook, “Honeymoon Kitchen’s Culinary Extravaganza of Vegetarian Delights”. I am going to a friend’s home with my Person and we’re going to hike, enjoy the lake and have dinner on the deck today. 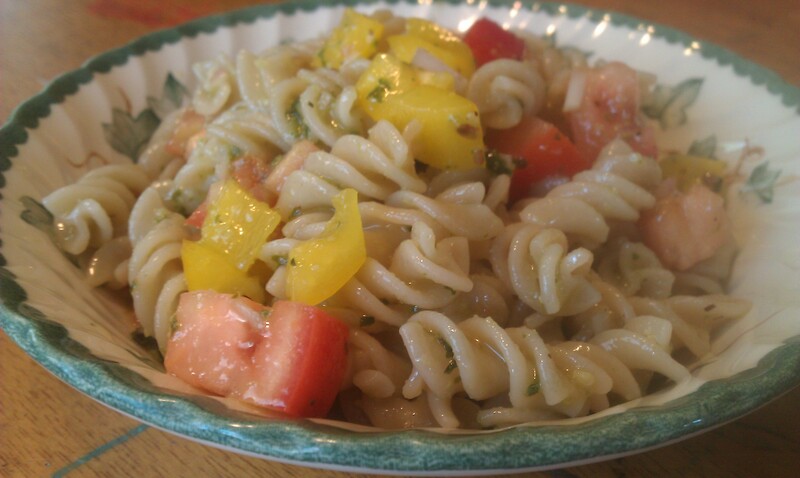 I tweaked this recipe and used brown rice pasta to make it gluten free so that my friend could enjoy it as well. I left out the olives simply because I don’t like them (I’ve yet to meet an olive that I actually like). I try to add as much color and veggies into my salad because I love the taste and the crunch of fresh veggies. Feel free to improvise and add your own veggie combinations. This recipe does call for a certain type of dressing and you can certainly use your own dressing if you’d like, but this is the dressing that makes this salad unique. Because of this dressing, my friends always request this salad when there are get togethers. The credit goes to my father for coming up with this dressing recipe, many years ago. 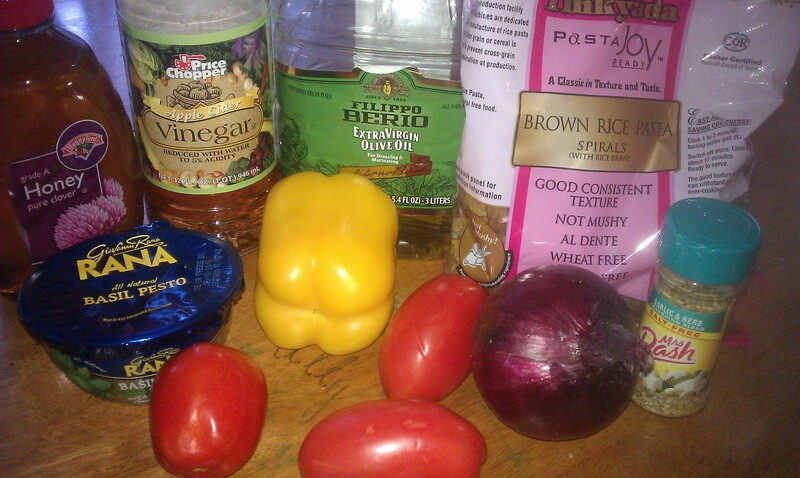 I use it on my salads, as a marinade, in guacamole, on baked potatoes and many other things. As well as being so versatile, it’s extremely healthy for you; no preservatives or refined sugars and you probably have most of the ingredients on hand, in your pantry. Cook pasta according to directions. Rinse in cold water and drain. Mix dressing and pesto together and mix into pasta. 1/2 tsp Mrs. Dash Garlic & Herb seasoning. Store at room temperature for up to two weeks. It will store longer in your fridge but keep in mind that oil will solidify a bit. I made sure to “quality control test” this salad after it was made. The verdict: Delicious!